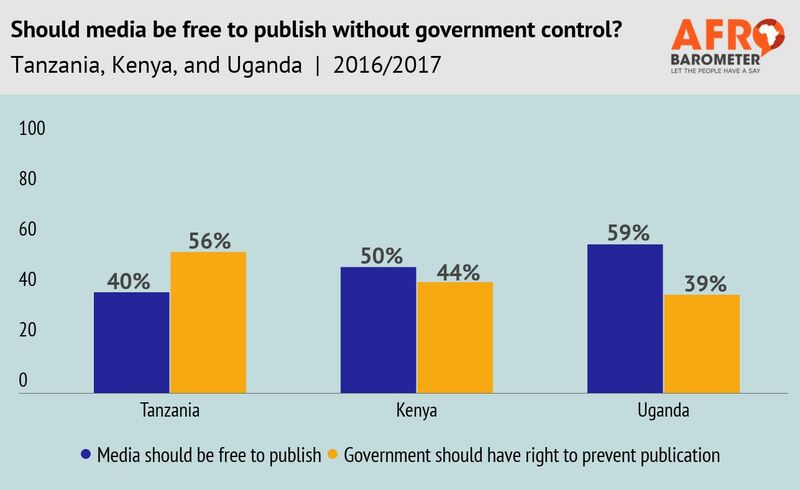 Popular support for a free news media has declined significantly in Kenya, Uganda, and Tanzania – three countries currently making headlines for government attempts to limit press freedom. Recent Afrobarometer surveys show that the proportion of respondents who say the government “should have the right to prevent the media from publishing things that it considers harmful to society” has risen sharply in Tanzania and Uganda, and more modestly in Kenya, over the past five years. At the same time, fewer citizens say they feel free to express their opinions. A law in Kenya that makes it a crime to publish information deemed false or misleading. Even before the new cybercrimes law, authorities had attacked journalists and shut down broadcast stations, and in March, eight columnists resigned from Kenya’s largest media group in protest against self-censorship by media owners and government infringements on media freedom. The Tanzanian government’s continued attack on free expression, including the suspension of media outlets, prosecution of journalists, restrictions on peaceful protests, and a proposed new law that would charge bloggers a hefty fee for a license and give the government the power to revoke licenses for disagreeable content. A proposed new tax on social-media use in Uganda, where the government shut down social media during the 2016 presidential election. Critics say the tax would limit citizens’ ability to share information and ideas.